Shirts With Random Triangles: 2016 DT Prospect Michael Dwumfour Flips Commitment From Penn St. To Michigan. 2016 DT Prospect Michael Dwumfour Flips Commitment From Penn St. To Michigan. Michael Dwumfour. Image via pensive.com. Penn State's loss is Michigan's gain. Wayne, NJ high school senior defensive tackle Michael Dwumfour has flipped his 2016 commitment from Penn St. to Michigan. Dwumfour first announced that he was decommitting from Penn St. via Twitter on Monday Morning. Monday afternoon came the announcement that Dwumfour had flipped his commitment to Michigan, the Nittany Lions' Big Ten East rival. 247 Sports grades Dwumfour as a composite three-star defensive tackle prospect. The recruiting website ranks Dwumfour at no. 58 among DT prospects for 2016, at no. 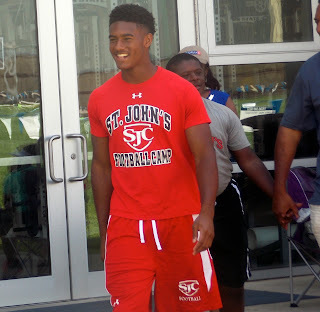 25 among 2016 prospects from the state of New Jersey, and at no. 964 in its composite rankings of 2016 prospects nationally. Dwumfour attends De Paul Catholic High School in Wayne, NJ. He stands 6'2, and weighs 286 lbs.